In the recording you can see a demo of some of the industries. 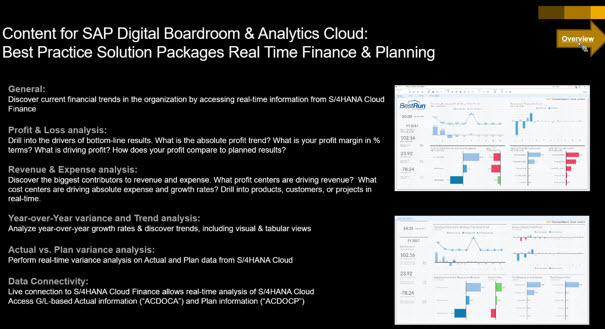 Upcoming content is shown in Figure 6. Q: Is this working also with BW/4 HANA? Q: Do we have some stories working on top of S4 CDS views? Q: what about non-SAP sources. e.g. Salesforce? 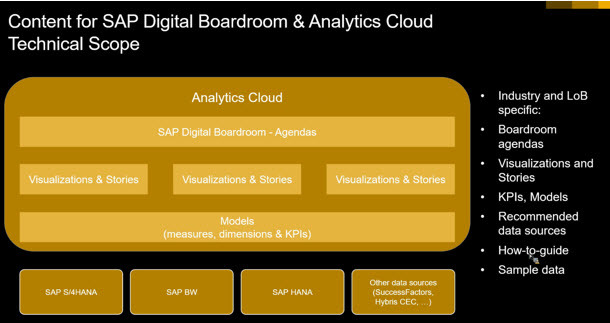 Q: Are End-to-end scenarios available to connect to data at SAP BPC, adjust in Analytics cloud and extract back to BPC seamlessly? Q: Do the packages depend on each other, e.g. the package from Q1.2016? 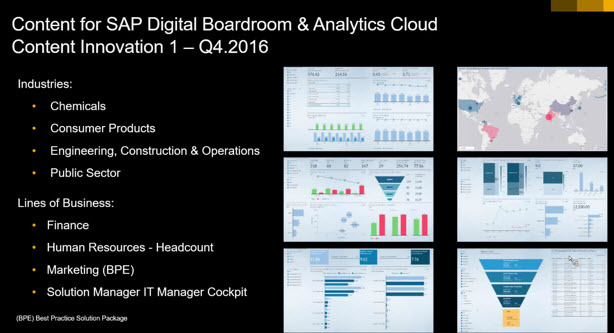 Q: Can this content only be used in the Digital Boardroom or also in the SAP BO Cloud without Digital Dashboard? 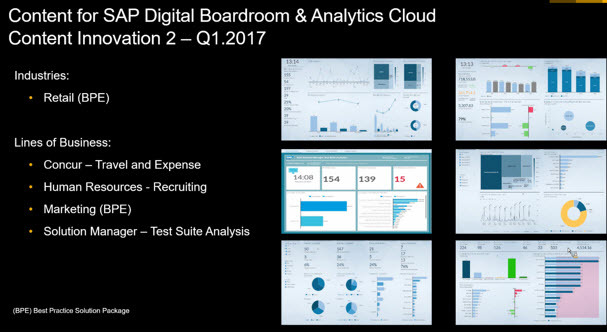 Q: – are you planning to have “responsive” stories as content for the Mobile SAP Analytics Cloud app? Q: How do you load your own data to the content? Q: Can you tweak the content to customize as per our requirements? 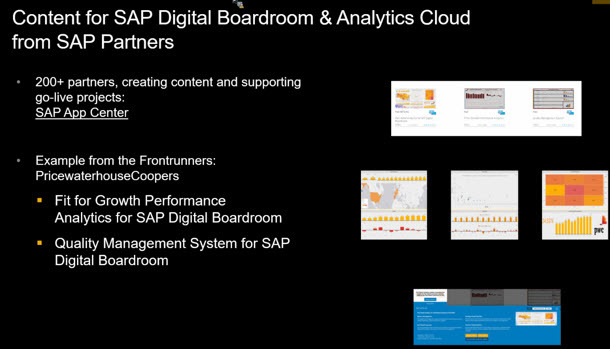 Q: If we already have partner RDS solution in the SAP Analytics Extension Directory, how can we make it more visible to the current content? Q: Is there portability between BOB and BI platform on premise? Q: Is it connected to live data or data has been extracted and cached for great performance? Q: Can we link Guided Machine Discovery to Boardroom Agenda’s? Q: Does this content require the back end to have certain table structure? Can it work with S4 and SAP ERP as well? What other data sources are supported for this industry content? Q: The Content looks very nice and easy? Is there possibility of starting with blank canvas and add these objects on as needed basis? 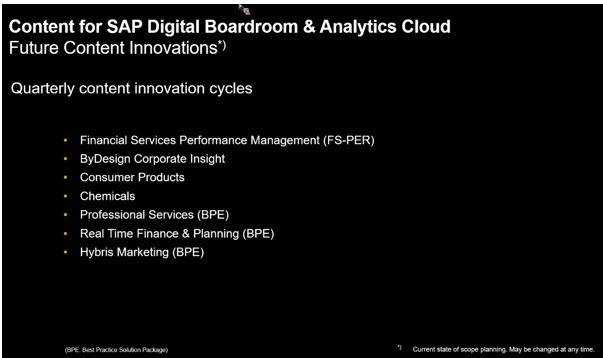 Also, can HANA views and BEx Queries be used as data sources for this content? 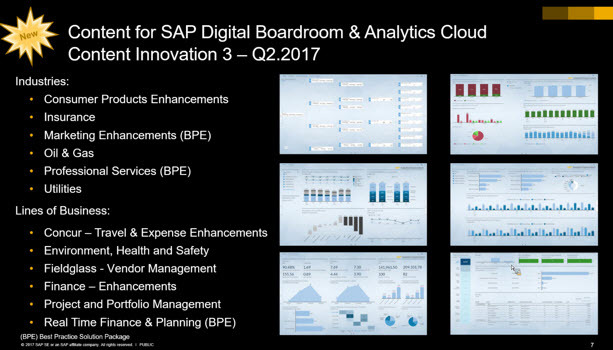 QP As a SAP Partner, can we use this content to showcase BOC to customers?